Walker Hayes' Mixtapes Keep Country Conversational : World Cafe With a looping station nicknamed "Loop Bryan," Hayes performed material from his two mixtapes at CMA Fest 2017. Here, he talks about writing songs whose unvarnished specificity makes them relatable. "I have ultimate freedom to write the truth," Walker Hayes says. He's released two mixtapes: 8Tracks Vol 1. and Vol. 2. 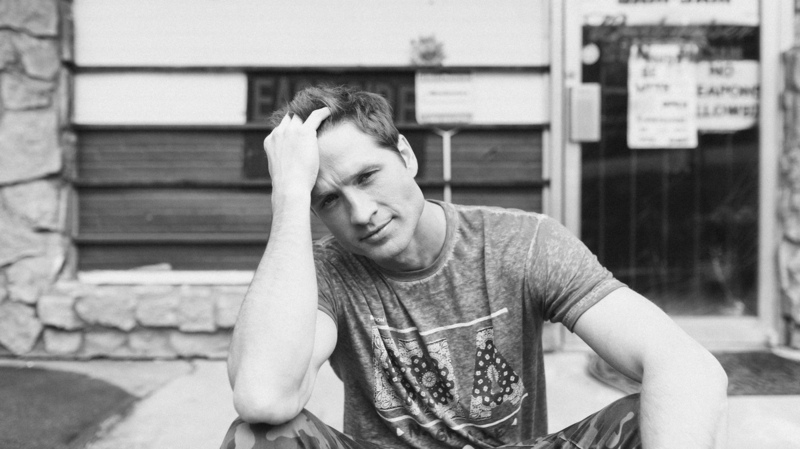 On one level, Walker Hayes' song "You Broke Up With Me" captures the satisfaction of coolly rebuffing renewed attention from an ex who once ditched you. The 37-year-old singer-songwriter puts the breezily blasé hook across with sly wit. But the song's true inspiration, he's quick to point out, was the way he felt about music industry contacts dropping him when he lost an earlier record deal and coming around again once his prospects improved. Now he has a sanguine take on the whole thing. "If you looked at me," says the Mobile, Ala., native, "I don't think I was a safe bet. You've got this dude who has hair down to his shoulders, working at Costco, drinking heavily, six kids and can't even barely pay my mortgage. And the stuff I was writing was so weird." Affably quirky is more like it. The demos of Hayes' songs — which he basically built by beat boxing, whistling, strumming acoustic guitar and sing-talking with mellow, syncopated swagger — merged Nashville songcraft, pop suaveness and homespun self-expression in a way that appealed to writer, producer and Monument Records exec Shane McAnally, who's had a ton of success translating outsider sensibilities into mainstream momentum. After more than a dozen years of hustling in Nashville, Hayes found himself with a new deal. At CMA Fest, he performed material from his two mixtapes — cleverly dubbed 8Tracks — as a one-man band, utilizing his looping station, which he referred to as "Loop Bryan." He asked the crowd to sing along with the chorus of his song "Lela's Stars" for the benefit of his daughter Lela, who was there watching. Her siblings were apparently on the premises too: A little while later, while Hayes fielded interview questions, still buzzing from the festival audience's enthusiasm, the whole brood walked by, with several kids calling out, "Hey dad!" and getting shushed by their mom (Hayes' wife, Laney). It was a fitting scene for an artist like Hayes, who enriches his work with the unvarnished textures of his family life. Have your kids seen you play here year after year? Actually, I don't think they've been down to CMA Fest. Today we brought 'em down because we knew we'd have passes and golf carts taking us where we needed to be. So that show, just now, was a new experience for them. They're blown away. As far as they're concerned, I'm famous, if you go ask 'em right now. Because we got the royal treatment today, and that was a big crowd. They've never seen something like that. How did it compare with playing during earlier eras of your career? I don't want to say anything bad about fans I've had before, but I just haven't had a lot. And most of those fans, they're family and friends. My sister would come from Murfreesboro [Tenn.] with a little crowd. But this today, oh my gosh. That was a group of people I've never seen before, a huge crowd of them, knowing the words. I felt like a rock star today, and that's not usually the case. I didn't know whether or not you'd be doing the looping thing today. That's something people are probably more familiar with in a pop context. The only other country acts I've seen do it are Charlie Worsham and Lindsay Ell, and they sort of use it as an excuse to shred. But for you, isn't it more of a way to translate the intimacy of your DIY recording approach to a live setting? Exactly. The whole reason we did it is when I got signed by Monument [Records] and Shane McAnally and SMACK [Songs], they loved those tracks that I built in my shack. They immediately compared it to Ed Sheeran-type of music, and they were like, "Can you do that live?" Because a lot of it was beat boxing, whistling, beating on tables, shakers and stuff. The difference, I guess, in me and Lindsay and Charlie — they're unbelievable and they are shredders. I'm not a shredder. Mine's so groove-oriented. I think the beat box is what separates mine. My music is just about that bounce and getting everybody moving. It feels like you're letting people in on your process onstage. What would you say that's done for how people connect with your songs? There's no band members they can watch. It's me by myself. So I basically get to have a conversation every night. I explain to them I'm gonna build these tracks, and I noticed lots of fans are [unfamiliar with] that. They'll even come up after and be like, "How were you doing that?" It allows me to tell my story. ... The loop is full exposure: I can mess it up and I've got to try again. I think the people like that close-up feel of my show. You mentioned working with Shane McAnally. Several years ago he helped launch Sam Hunt with an acoustic mixtape. Did you have that in the back of your mind when you brought him the demos? What did you make of his interest in putting them out? It was honestly Robert Carlton's idea, who works with Shane. ... Here's what we thought when we put out those 8Tracks: "These aren't gonna fit on country radio right now, but country music fans will love these." It's a unique concept. There's not a lot of [country] labels who are like, "Hey, let's put out free music." But I had to kinda test the waters. I had to get these fans ready for my singles, 'cause my stuff is a little bit different. I loved the idea of giving out music, because otherwise I would've played this stage today and they maybe only would've known the single. And not the deep cuts. And yeah, that worked for Sam. He kind of had that same experience where you'd go see him live and I was like, "How do people know this song? I've never even heard this." And it was from those mixtapes. The way Music Row songwriting typically works is that songs that are considered successful are songs that any number of artists could record, that feel universal. You, on the other hand, fill your lyrics with details that feel conversational and particular. Are you waiting for the country format to catch up? Do you feel like it already is? If you listen to songs that are outside cuts — songs that songwriters wrote and other artists cut — generally they're generic. They don't really dive into the cracks of the emotions or the scenery in a song. You could be talking about God or a girl. I for so long tried to get outside cuts, but my nature was to always be specific. When Shane and Robert signed me, they said for some reason the more specific I was, the more everyone could relate. So instead of putting a truck [in my lyrics] just because that is the country thing, I talk about my Honda, because that's what I drive. ... I noticed quickly that people loved those specific things. But honestly, I don't think I'm the first that ever did that. Taylor Swift, I don't ever hear anything of hers where I'm like, "Oh, so-and-so could've cut that." It's pretty freakin' specific. One of the reasons I think she is so huge is because so many listeners heard her stuff and went, "I feel that way." I hope that's where my music fits, and I hope I can always continue to not leave out the details. I don't think that's a good idea, to leave them out to appeal to more people. You told the stories behind the songs on stage. A lot of them had to do with the low points you've experienced in recent years, when you had few prospects musically and were just trying to keep your family afloat. Honestly, when I was going through those dark times, when I was working at Costco, we were down to one car. Six kids, one car. A friend of mine gave me the title to an old minivan. I got the job at Costco from a friend who showed up to hear me [play]. Like, they were just a fan, and I was so embarrassed, but I was like, "Hey, I know you work at Costco. Are they looking for people?" All those times, I don't ever wanna go back to that. They were scary times for us. All of my music has to do with that struggle, and that happens to be what people relate to. If I never had those times to write about, I don't know if I'd be here today singing to fans who can relate to 'em. It's really therapeutic to me to sing about those times. A lot of my new music is about recovering from addiction. During that whole time, I was drinking to not face the heaviness of life. Instead of me singing about, "Hey, let's get drunk," I sing about, "Hey, let's get sober." What's it like maintaining an open dialogue with your wife about the truthfulness of how you're describing experiences you shared? When I write a song that is so personal, I take it to her. ... Because it's also about her and I want to have respect for her. Like, "Did I say anything here that made you mad? Do you mind if I give people this picture of our life?" She is a fan of that, because she wants people to know what you can survive. I listened back to some of your older stuff. You had some wry pop-rock leanings then too, but your vocal delivery has shifted in a more cool, conversational, hip-hop and pop-influenced direction. How'd you recalibrate your delivery? Now, as a vocalist, I don't feel like I'm trying as hard. A lot of that [older] stuff, I hear myself singing and I'm trying so hard to be country. It kinda makes me cringe. But now I just want to keep it conversational. That's what I want all my songs to be. Country singers used to be known for their robust vocal attacks, for belting, for singing hard. But you're part of a newer generation of artists departing from that. I love both. I just lean more toward the conversational pop elements. Like, how would you just say a line to somebody if you were talking to them? Honestly, I can't belt it. I mean, I can a little bit, I guess, but there's no need for me to do that in these songs. Sometimes when you belt, it kinda makes the song more dramatic than it really needs to be. There are certain songs that you hear and you're like, "Wow, he's singing about his girlfriend, but he sounds kinda mad the way he's yelling, 'You're so pretty!'" It's like, "I don't know if anger is the emotion [he should be conveying]." You're talking about the difference between taking a small interaction and amplifying it into a dramatic situation and what you do, which is more like bringing wrenching moments down to ground level. Shane and I wrote that song "Beer In The Fridge" and it's as dark as it gets. It's about me thinking of [my wife] Laney leaving me and being like, "You're the reason I want to quit and you're the reason I want to get drunk." I think if you maybe approached that as a traditional country song, it might've been a bigger production and darker and a lot louder. ... To me [our quiet, deflated approach] gets to the real emotion more than being like, "Oh, here comes the chorus. We've gotta make it intense. What do you feel like is working for you now? What didn't work the first time around? I feel like it's this: For 13 years people would see me and they'd be like, "Can you just not sing about this, and can you sing like this, and wear this? We could make a lot of money together." That does work for a lot of people that come to Nashville. But what is different about this time is that Shane listened really close to my songs. What he said was, "When you chase what's mainstream, it's not believable. But when you go into a writer's room and you feel freedom, I can hear it in the songs that you turn in." ... So I have ultimate freedom to write the truth. To me that's the biggest difference — and I got a haircut.